Fig. 3.7 Boron toxicity in the leaves of lentil. 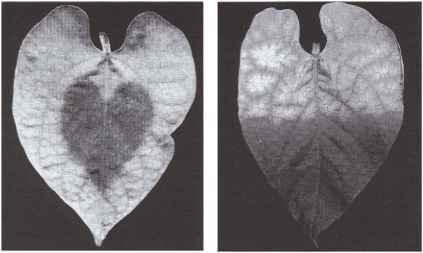 (Left) control; (right) boron toxicity. (i.e., phloem loading) and the water is sucked into the phloem, creating a positive internal pressure. This pressure induces a mass flow in the phloem to the sites of lower positive pressure caused by removal of solutes from the phloem. Flow rate and direction of flow are therefore closely related to the release or unloading at the sink. 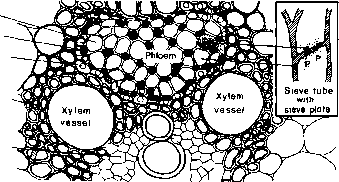 This type of pressure-driven mass flow in the phloem differs from that in the xylem in three important ways: (a) Organic compounds are the dominant solutes in the phloem sap; (b) transport takes place in living cells; and (c) the unloading of solutes at the sink plays an important role. Effect of Transpiration Rates of the Shoots of Red Pepper during Fruit Growth on the Mineral Element Content of the Fruits"
"From Mix and Marschner (1976b). roots where it is confined to the basal zones. From here a considerable net efflux of sodium takes place (Lessani and Marschner, 1978). This example also reflects the role of phloem transport in cycling of mineral elements and particularly in prevention of sodium accumulation in the shoots of natrophobic plant species. The capacity of bidirectional, ion specific long-distance transport is causally related to the physiology and anatomy of the phloem and its elements. Within the phloem the sieve tube elements are associated with companion cells and parenchyma cells (Fig. 3.9). Some of these individual sieve tube elements are stretched end to end in a long series, forming the sieve tubes which are connected by conspicuous pores (inset, Fig. 3.9) called sieve plate pores. The sieve tubes are highly specialized vascular systems for the long-distance transport of solutes. The sieve tube cells contain a thin layer of cytoplasm, which forms transcellular filaments (the so-called P-protein) that pass through the sieve plate pores. The anatomical features of long-distance transport in the sieve tube across the sieve plate pores are similar to those of short-distance transport in the symplasm across the plasmodesmata. Fig. 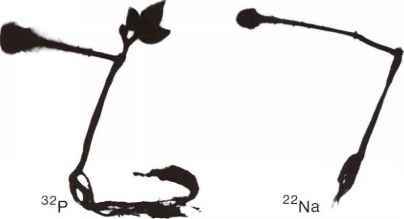 3.10 Retranslocation of labeled phosphorus (32P) and sodium (22Na) after application to the tip of a primary leaf of bean. Autoradiogram, 24 h after application. polysaccharide. There is good evidence that callose can swell rapidly and fill the pores, thus blocking long-distance transport in the sieve tubes. Callose formation is strongly enhanced by Ca2+ even at a concentration of a few pu (Kauss, 1987). This means that only very low concentrations of free Ca2+ can be present in the phloem sap for the normal functioning of long-distance transport. Plugging sieve tube pores is also induced by such factors as heat treatment or mechanical perturbation of the stem (Jaffe et al., 1985), as well as by mechanical injury of the sieve tubes, by incision, for example. Incision causes a sudden fall in the high internal pressure of the sieve tubes (>10 bars), which presumably triggers the mechanism of plugging the sieve tube plates. Considering the role of sieve tubes as food-connecting channels, this process can be thought of as performing the same function as a 'security valve' that prevents 'bleeding' when the system is injured. For experimental studies on long-distance transport this plugging mechanism is both an advantage and a disadvantage. It is an advantage in that very soon after decapitation of a plant, only xylem exudate is obtained at the stump of the root or stem; it is a disadvantage, in that, with a few exceptions - for example, the inflorescent stalks of certain palm tree species - it is very difficult to collect phloem exudate and thus to conduct extended studies on the mineral element composition of the phloem sap. There are some plant species (e.g., Ricinus and Lupinus spp.) from which small amounts of phloem exudate can be collected relatively easily by careful incision. However, with the incision technique there is always a possibility of contaminating the phloem sap by cut parenchyma cells and by substances from the apoplasm. Another method is to use sucking insects such as aphids and plant hoppers. In the process of feeding, these insects insert their stylet into the phloem tissue and sieve tubes. 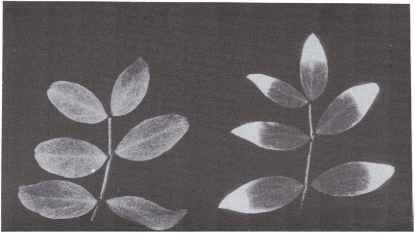 If the stylet is severed, for example with a laser beam (Hayashi and Chino, 1990) it remains in the tissue and the high internal pressure within the sieve tubes forces the phloem sap out of the open end of the stylet. 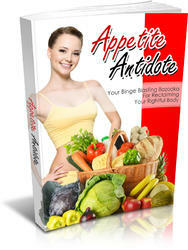 This technique, of course, is very difficult, and the amounts of exudate obtained are quite small. For these reasons our knowledge of long-distance transport based on phloem sap analysis is rather limited, particularly for mineral elements. Where is the pressure in the phloem when nutrient transport?